WIRE-NAIL AUTOMATIC MACHINES is intended for manufacture a sole and a heel of nails on OST 17-272-78, building nails in accordance with GOST 4028-63. For shoe nails a wire round, a hot rolling from carbonaceous steel of ordinary quality, for building nails a wire steel light low carbonaceous general purpose, thermally not treated with dв=800 МРа in revolts and spools in weight up to 1000 kg. • Editing a wire in the correct - roller device. • Feeding for the size of a nail. • A clip of a wire. • A cut of a wire and reset of a nail. • Landing the head of a nail . The other point of the clamp being cut off is formed simultaneously. • WIRE-NAIL AUTOMATIC MACHINES is delivered with a package of spare quickly worn details and completed with the instrument for maximal diameter of a wire with which the automatic machine passed production tests. The instrument on other standard sizes of a nail is delivered at additional expense. • At additional expense WIRE-NAIL AUTOMATIC MACHINES is completed with the device for a unwinding of wire РУ31А. 1. Auger device. It is designed for transportation of nails from under the tray into the container. Thus, during transportation of nails cut-offsare separated and sent to a separate container. 2. The second lubrication circuit. This centralized lubrication is driven by a separate electric drive. It works on thethick lubricant through dosed feeders. Lubrication is triggered periodically, for example, after 1 hour and it delivers a portion of the lubrication to points. Telescopic connection of feed lever - 1 point. to improve the lubricants reliability and reduce the time required for machine lubrication. 3. Equipment of wire-nailing machines with frequency converters of induction motors. This allows smooth handling of productivity from minimum to maximum. Currently, nailing machines have only two speeds due to changeable pulleys. 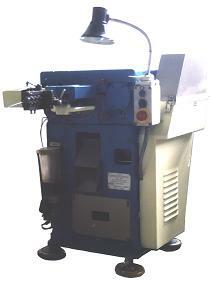 This allows to increaseproductivity of nail making machines by an average by 10% due to choice of optimum speed.